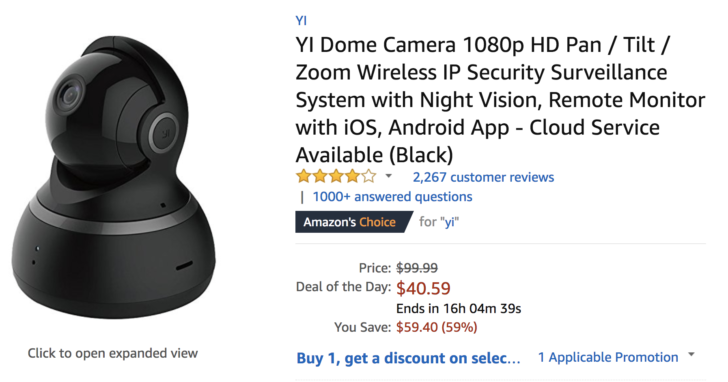 Right now, you can pick up the Yi Dome for just $40.59, which bags you a saving of $59.40 against the usual price. That's not bad considering the camera has 360-degree coverage, shoots in 1080p, and offers real-time activity alerts. Ryan reviewed it last year and was impressed with its features given how inexpensive it is. At the time of writing, there are just over 16 hours left in which you can make the most of this deal, so be quick if you don't want to miss out. There's no coupon code to enter; simply head to Amazon and pop the Yi Dome in your basket. It's available in either black or white, so you can go with whichever is most likely to blend in with your decor.